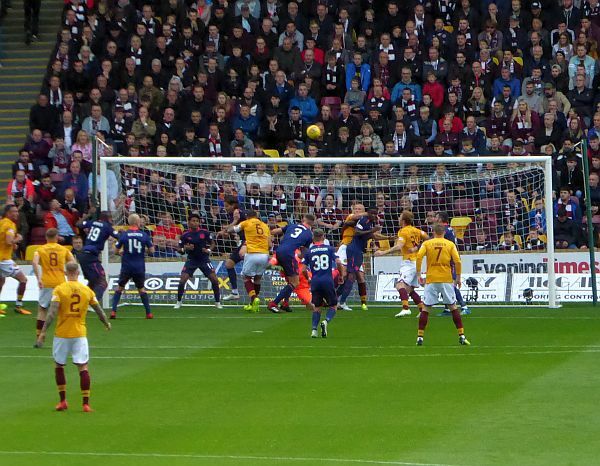 Motherwell return to action on Sunday when Hearts come to Fir Park for the fourth meeting of the teams this season. The visitors have the upper hand so far but with the ‘Well on a five game winning streak the home crowd will have high hopes. While Hearts were entertaining Auchinleck Talbot last weekend Motherwell had an enforced rest thanks to an early cup exit. Although Craig Levein’s team progressed with a 4-0 win there was a cost to be paid. Michael Smith (right back) sustained a thigh injury that could keep him out for a couple of months. Demetri Mitchell (left back) also joined the injury list. Together they will force defensive changes on Sunday. But it has not been all bad news for Hearts. Uche Ikpeazu, Stephen Naismith and Christophe Berra have returned to the team after lengthy absences and they will pose us a few problems. Motherwell have no such concerns. It is often said that a winning team suffers few injuries and that has been the case in recent weeks. Stephen Robinson has been able to select the same eleven for four in a row and there is every possibility that we may see a fifth appearance for the lunchtime kick-off. BT Sport have chosen this fixture and the crazy start time. They may have stumbled on a cracker. Let’s give them a game to remember with a 3-1 home win. Remember the last visit of Hearts?